Thanks to the participation of Kentucky attorneys, the IOLTA Fund is able to make significant contributions to support legal and pro bono programs across the Commonwealth. IOLTA Compliance Certification Form. Login to your Kentucky Bar Association account to complete your annual compliance certification online. IOLTA Account Authorization Form. Use this form to authorize your trust account to become an IOLTA account. Kentucky Supreme Court Rule 3.830. This rule establishes the Kentucky IOLTA Fund and all related procedures. 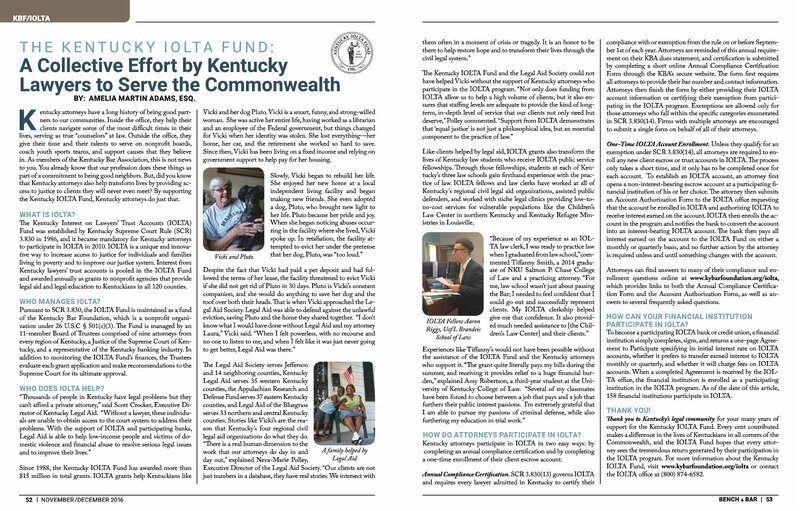 For an overview of the Kentucky IOLTA Fund, click the image below to read our article in Bench & Bar magazine. Click here to view the entire issue online. Who is required to participate in the IOLTA program? Pursuant to Kentucky Supreme Court Rule 3.830, all Kentucky attorneys must participate in the IOLTA program unless they qualify for an exemption. Who is exempt from participating in the IOLTA program? A lawyer is exempt from participating in the IOLTA program if he or she falls within one of the specific exemptions in SCR 3.830(14). The more common exemptions include attorneys who are not engaged in private practice, do not have trust accounts in Kentucky, do not manage or handle client trust funds, or for whom compliance would be extremely impractical, based on the geographic distance between the lawyer's principal office and the closest participating financial institution, or on other compelling and necessary factors. For exemption questions, or to request a hardship exemption, contact the Kentucky IOLTA Fund office at (800) 874-6582. When and how do I certify my compliance with SCR 3.830? SCR 3.830(13) requires that all Kentucky lawyers certify annually on or before September 1 of each year that they are in compliance with, or exempt from, the provisions of that rule requiring participation in IOLTA. Attorneys may certify their compliance using this online form after logging into their Kentucky Bar Association online account. Alternatively, attorneys who prefer submitting their certification via mail may request a printable form by contacting Program Manager Gwen Smallenburg at gsmallenburg@kybar.org or (800) 874-6582. What Kentucky banks participate in the IOLTA program? Currently, 154 banks across Kentucky offer IOLTA accounts to their customers. Many have recognized the important public purpose served by the IOLTA program and have waived fees on these accounts, in addition to paying favorable interest rates. Their support and generosity of these partner banks enables the IOLTA Fund to award significant grants for legal aid each year. Click here to see a list of participating banks. How does my bank become a participating IOLTA bank? If your bank does not presently participate in the IOLTA program and is interested in becoming a participant, please have your bank contact Program Manager Gwen Smallenburg at gsmallenburg@kybar.org or (800) 874-6582. Additional information about becoming a participating bank is available here. What if my bank will not offer an IOLTA account for my practice? Should a lawyer's bank refuse to offer an IOLTA account, the attorney will need to move his or her trust account to a bank that does offer IOLTA accounts. The IOLTA Fund can help you to locate a participating bank in your area, so please contact us at (800) 874-6582 if you need assistance. How do I open an IOLTA account? To open an account, first open a standard, non-interest-bearing client trust account. This account may then be added to the IOLTA program by submitting an Authorization for Kentucky IOLTA Account form to the IOLTA Fund, which may be submitted online here or via mail by printing, completing, and mailing the form to the Kentucky IOLTA Office, 514 W. Main Street, Frankfort, KY 40601-1812. The Fund will then enter the account into its records and forward the authorization form to the bank. The bank will then convert the account to interest-bearing and assign the Kentucky Bar Foundation's tax identification number to the account to ensure that the interest is properly reported as being paid to the IOLTA Fund, a nonprofit organization. The bank will change the account name to "Kentucky Bar Foundation IOLTA Trust account for [name of lawyer or firm]." This is necessary to prevent the Internal Revenue Service from issuing a "B" notice to the lawyer because the named holder of the account and the tax identification number do not match. This account name change does not limit a lawyer's flexibility in choosing the name to be printed on checks and deposit slips. Since the IOLTA Fund is the beneficial holder of the interest, IOLTA client trust accounts qualify for interest-bearing accounts that are open to individual attorneys and law firms, regardless of whether the firm is a partnership, limited liability company, or professional service corporation. Who pays the bank service fees on an IOLTA account? Enrolling a client trust account in the IOLTA program does not result in additional bank service charges for lawyers because the IOLTA Fund pays any reasonable bank charges or service fees associated with the account's interest-bearing status. Lawyers remain responsible for all other fees, such as check printing charges, wire transfer fees, and overdraft fees. Who pays tax on interest generated by IOLTA accounts? Since IOLTA is a special fund of The Kentucky Bar Foundation, Inc., a 26 U.S.C. § 501(c)(3) tax-exempt organization with beneficial ownership of interest generated by IOLTA accounts, all such interest is exempt from tax under federal and state tax laws. Where should the bank statements and notices for my IOLTA account be sent? They should be sent to the attorney or firm in charge of the account, not to the Kentucky IOLTA Fund. What if I need to change the details of my IOLTA account? Lawyers are required to keep the IOLTA Fund informed of any changes to their IOLTA accounts or their law firm affiliation. Who do I contact if there is an overdraft in my IOLTA account? Overdrafts are managed by the Kentucky Office of Bar Counsel. If your IOLTA account is overdrawn, contact the OBC at (502) 564-3795. Overdrafts are not managed by the Kentucky IOLTA Fund office. Is my IOLTA account information confidential? The IOLTA Fund may periodically recognize those lawyers, firms, and banks that participate in the program. Any other information that the Fund receives regarding IOLTA accounts is confidential and available only to IOLTA staff and Trustees. Kentucky IOLTA Fund and Class Action Residual Funds. Kentucky Rule of Civil Procedure (CR) 23.05 sets forth the procedures governing a proposed settlement, voluntary dismissal, or compromise of a class action. CR 23.05(6) address the disposition of any "residual funds," which are funds remaining after the payment of all approved claims, expenses, costs, fees, and other court-approved disbursements to implement the relief granted. In actions where the claims process has been exhausted and residual funds remain, 23.05(6)(b) requires that not less than 25% of the residual funds be disbursed to the Civil Rule 23 Account maintained by the Kentucky IOLTA Fund Board of Trustees. Such funds are then allocated to Kentucky's civil legal aid organizations to support activities and programs that promote access to the civil justice system for low-income resident of Kentucky.